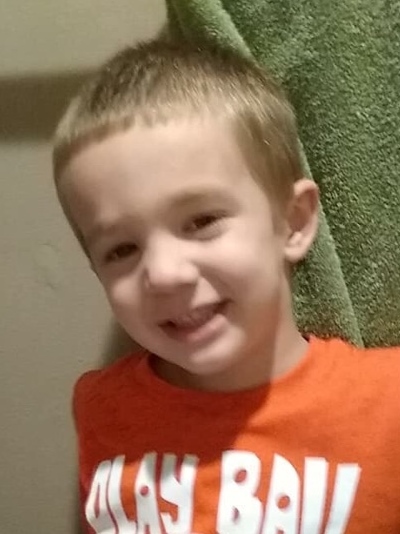 Colton Brantley Harris, 3, of West Baden, passed away Monday, December 3, 2018 at IU Health Paoli Hospital. He was born March 6, 2015 in Bedford, IN. to parents, Tyler & Brittany (Palmer) Harris. He is survived by: parents Tyler & Brittany Harris of West Baden; brothers- Andrew Harris & Hunter Harris both of West Baden. maternal grandparents- Shana & Cory Ferguson of West Baden; maternal grandfather- Marshall Palmer of Columbus; paternal grandmother- Kerry Harris of Paoli; paternal grandfather- Paul Harris of Paoli; maternal great-grandmother- Shelly Frazee of Columbus; maternal great-grandmother- Marsha Feree of Paoli; paternal great-grandmother- Norma Harris of Orleans. Visitation will be from 4-8pm Friday, December 7, 2018 at McAdams Mortuary.